in this year's American Realness festival. 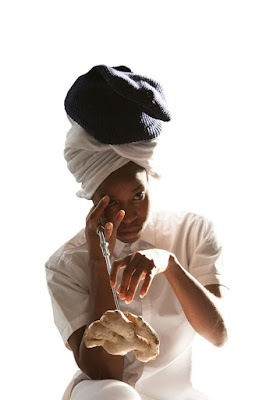 The Black Canadian dance artist Dana Michel--who made a big splash at home and here in New York in 2014 with her solo Yellow Towel--is back with a new solo, Mercurial George, at Abrons Arts Center for American Realness. She has described the hour-long piece as an act of “wading through the hairy rubble of a preliminary anthropological dig” asking “What is the smell of a plethora of someones that you have been avoiding your whole life? What do you do with the body?” A seeming extension of Yellow Towel, with its genesis in racial stereotypes, Mercurial George implies the release of an authentic identity not imposed by others. This is pertinent for exploration. Identity and marginal otherness--from immigration status to religion to gender--are battlegrounds with renewed real life-or-death stakes in the current moment. And Michel is a curious, fearless explorer, eccentric and mercurial indeed in her body language, fascination with the odd prop oddly used, and tendency to randomly mumble or declaim. She opens dimensions of mind and body that we usually declare unseemly and diseased and seems to say, "Look what else is here." It's an interesting task and an interesting approach, requiring a performer who can submerge her calm, charming persona and grab hold of a viewer, no matter how resistant, for the space of an hour. Not easy. Go take a look and see what else is there. Mercurial George will be presented again on Monday, January 9 at 4pm and Tuesday, January 10 at 7pm. Run Time: 55 minutes. For information on this and other American Realness events, now through January 12, click here. 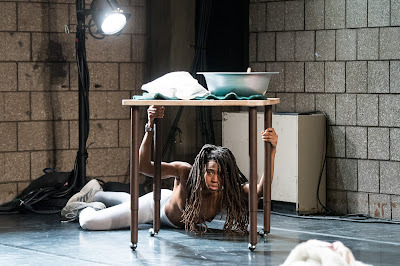 I was pleased that Fernando Maneca commented on Facebook about the history of New Dance Alliance presenting the early work of Dana Michel as part of the Performance Mix Festival. Fernando had said that we presented her in 2009, but in fact we first presented her in 2007 at Joyce SoHo. I then invited her to show work under the pseudonym Charlie Heatherington (VISA fears) "1976" on a shared evening with myself, Jil Guyon and Joanna Meyers for a Femmes night at Dixon Place in 2011. This was developing material for "Yellow Towel." 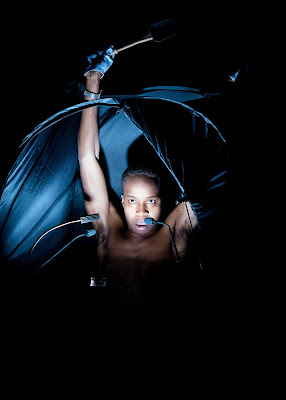 In 2014 (piggy backed on American Realness VISA) she presented developing work in the Performance Mix Festival, which the beginnings of "Mercurial George". For this performance she was chosen as soloist pick of the year in the New York Times. I dare say now, it is difficult to secure a return visit to Performance Mix. Perhaps a dinner invitation.